Waking up to the sound of jackhammering at 6:57 on a Saturday morning. I know it’s perfectly legal to do this at 7am to 7pm, but when the construction companies and the Land Transport Authority ask for our understanding whenever they need to work through the night, don’t they ever think to give some consideration back? Before Caleb arrived the largest question on our minds was “how would Anne take to having a brother?” It would be a different experience. How would we handle having to divide our attention between the two? More accurately, how could we show Anne that she’s still an important part of our lives when Caleb’s first few months would consume almost every waking moment? We decided that involvement would be the best alternative. Rather than treat the second child as a second separate “project”, Anne would be heavily involved in Caleb’s formative months. We’d look at it as a team of 3 bringing up a new baby, rather than a pair of parents juggling. Anne’s been most wonderful. She’s taken on the role of big sister, often running to Caleb the moment he cries (though it’s not our prescribed course of action). A few times she’s asked us not to go to Caleb’s aid. A few moments would pass and Anne would run out of ideas while Caleb continues crying. “Ok you can come in now!” She’s bossy. But which big sister isn’t? The nights are a different matter. In her semi-comatose tiredness, Anne transforms from big sister to daughter. She demands Faith’s attention, and you can see it in her eyes that she doesn’t understand why Mummy needs to be somewhere else. It’s tiring for us, having to deal with two children whose bedtimes sometimes collide. Anne, with her psychological eczema that fires up whenever she’s put to bed. Caleb who always falls asleep halfway through his meal, meaning he’ll wake up a lot sooner and more frequently. But somehow God gives us sufficient grace. It isn’t a walk in the park, but we’re discovering that we wouldn’t learn as much if things were easy peasy. We wouldn’t learn as much about God’s timely provision or the need to pray. If the road wasn’t this hard, I certainly wouldn’t have realised how wonderful Faith has been - how resilient and loving a partner, a wife and mother she is. So in these days of sleeplessness it is good to take time to marvel at how life goes on despite the little control we really have; that God provides just enough, and somehow just enough is more abundant than excess. Faith’s parents bought Anne a Nemo (from Finding Nemo, not 20,000 Leagues) balloon. Though once the domain of clowns, the balloon has managed to work up quite a scare, especially when I’m working the night shift tending to Caleb. Last night Anne was howling non-stop for Faith’s attention, which was taken up by hungry boy Caleb in the other room. “I want Mummy! I don’t want Daddy!”, an extremely familiar refrain for fathers who have the audacity to think themselves adequate substitutes to motherly affection. She screamed and cried, then stood up and pointed to the door behind me. Relief, I thought - Faith must have finally placated the younger child and was coming into the room. I turned around and instead of seeing my wife’s silhouette walking through the door, a huge bulbous shadow loomed in its place. Chills ran up my spine. Stupid Nemo! Just a few moments ago I was washing milk bottles at the sink, which overlooks a bar counter and into our dining room. 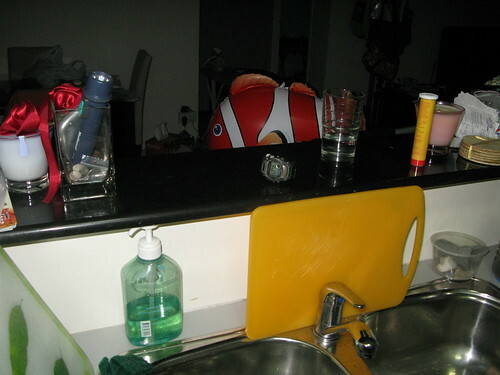 Nemo floated from under the bar counter and stared at me with its dead, painted-on eyes. Holy crap, I exclaimed to myself. The darned balloon has got to be the scariest thing in this house. I stood at the reception of Gleneagles hospital, looking out for my father-in-law’s car which would soon make its way up the small hill and unto the roundabout in front of the hospital. He was picking us up. Us - Faith, myself and newborn Caleb. It occurred to me that the going-ons at hospitals were very similar to that of airports. I don’t mean to trivialise anything, but the hospital is a place of arrivals and departures. In the elevator you would likely face the wide grin of a new father, while in the corner two women are huddled, sobbing in reaction to news they had just received. The emotions are intense as the destinations here are more permanent and life-changing, for both the people involved as well as the family that surround them. Gleneagles seems to handle all this with a cavalier Melrose Place, Beverly Hills feel. A ring of exotic sports cars and extremely expensive saloons greet you as you come to the entrance of the hospital. Most of these are owned by the doctors who work in the hospital. Whilst waiting for my father-in-law to pull up, I notice how doctors would drive right up and leave their cars at the door, grab their briefcase and toss their keys to the valet. “Rockstar”, I whisper to myself, the word that first comes to mind. My thoughts drift. Why do doctors make so much money? Should health, a commodity that hardly counts itself as a luxury good, cost so much? A man who suffers from cancer shouldn’t have to pay so much more than a man who caught a cold - none of them chose their respective illnesses. I don’t know how difficult becoming a doctor is, but in this age of information sharing, shouldn’t medical expertise be more accessible? A doctor gets into his Maserati and pulls out of his parking lot. A family sits in front of the cashier, wondering. Why do we keep giving birth to nocturnal babies? Are we living in the wrong time zone? Caleb arrived, 3:46am in this morning, exactly 3 years and 1 day after his sister Anne. His eyes are huge and he didn’t really want to cry even as the nurses sucked out the mucus from his mouth. Faith’s water broke! We’re off to the hospital! Happy birthday Anne. It’s been an amazing 3 years. After more than a year of carrying my child, the Ministry of Education website is finally alive. Quite a few people have come up to me, patted me on the back and said “thank goodness that’s over, huh.” I’m immensely relieved that it’s out because the coordination of a million moving parts wasn’t an easy task at all, but a good website is one that is never done. It grows, evolves, gets better with age. In the 2 days that it’s been live, I’ve restructured information, tweaked font-sizes for the printer stylesheets, made some things more apparent and some things less so, all based on the feedback I’ve received from people using the site. I’m glad the site is finally free of the encumbrance of the rather immobile content-management system it was chained to. The best part about the launch thus far has been interacting with real people who use the site. I’ve managed to turn comments, suggestions and complaints into real action on the website, and a number of these users were delighted to see their needs met almost immediately. We’ve been working on fictional personas, and it’s not the same. Now when your users are living, breathing people, the website really lives up to its intended purposes of serving its community.